Yesterday morning, I got up early like I've been trying to do and began to make bread. 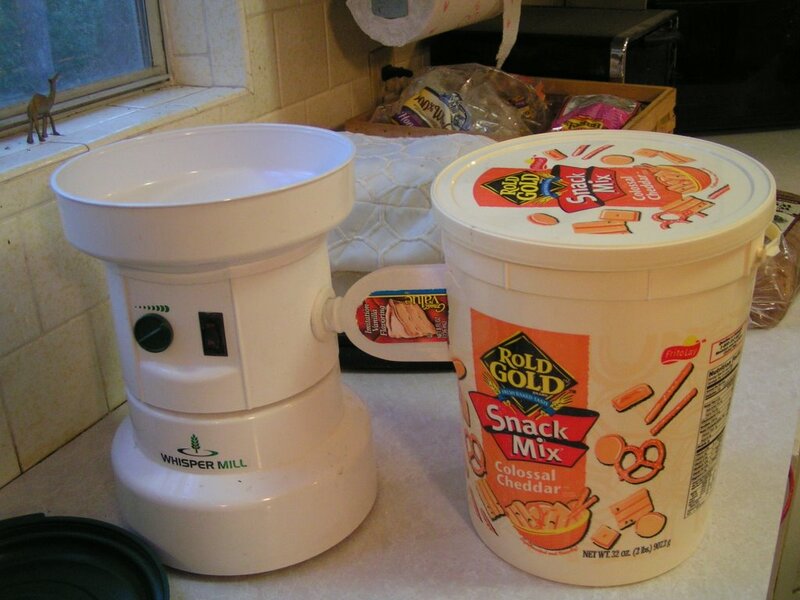 The first thing I do is to grind wheat in our Whisper Mill so that I have fresh whole wheat flour to work with. This morning, I did things at usual. I measured out the wheat, made sure I turned the mill on before adding it, as the directions say, and poured some wheat in. Then, I noticed that the little spout the wheat went through after being ground wasn't stuck in all the way. So, without really thinking, I turned the mill off, with wheat still in the top. I stuck the spout in tighter, and turned it on. Now, I figured out that there really is a reason the mill says "Turn on before adding wheat!" Anyways, the mill started sounding really bad! So, I turned it off, poured the wheat out, then turned it back on and added the wheat. And again, it sounded BAD! So, I did what every maiden in distress does, I called for my dear knight (daddy) to come and rescue me! Elijah also heard the horrid sound and my plea for help, and came bounding down the stairs to see what was wrong. Together Daddy and Elijah diagnosed the problem, and Elijah began taking the mill apart. He unscrewed the bottom, found more screws, and unscrewed those so that the mill was in three pieces. We then called daddy, and found that the fan that turns so that the wheat will grind was stuck. We soon found that the side where the flour came out was clogged, and by moving the fan slowly, eventually everything was out of the inside. So, Elijah put the mill back together. Then, we hooked it up, turned it on, added wheat.... and it sounded bad again! After much exploring, we finally realized that the spout was plugged. It had been a little damp when I'd put it together, and the flour had plugged the little spout, so the it just kept building up inside, making an awful sound. Then, Elijah, having the engineer mind that he has, decided that he could make something that worked just as well or better, resulting in this! What a wonderful family I have... Thankful even when they didn't end up having fresh, homemade bread yesterday! I'm returning your blog visit :). I hope you stop by often! I enjoyed perusing your blog and loved the pictures. My family has a Whisper Mill too that we use to make whole wheat bread. My mom has written on the mill in permanent marker, "Turn on before filling," just as a safeguard :).